Studio Artist 4 is a complete rewrite from the ground up of the old Studio Artist code base. By doing so, we were able to modernize the underlying code, which will serve as a solid foundation for future development. The new code runs native on both Apple Intel and PPC architectures. The new code is also platform agnostic, so Studio Artist can run native on Windows computers as well as Apple Macs. Most of the old Studio Artist functionality was ported over to new version 4. Many new features were added, and there were a ton of enhancements made to old existing features. In a few cases, features were dropped or changed. Some more information on these changes is provided below for owners of previous versions of Studio Artist. The overall workspace is much more configurable in version 4. Rather than the controls being fixed on the left side of the window, you have total flexibility to position control palettes as you please. Either docked to the main canvas window, or as floating palettes (perhaps on a second monitor). You can dock the palettes and toolbars by dragging them onto the main canvas near the edge you wish them to dock at. You can also dock on top of an existing already docked palette, and then they will nest in place as tabbed palettes. There are 4 layout memories available in the main windows menu which you can use to quickly save and restore your custom workspace configurations. So you might have one layout for editing presets, another for painting with a large canvas area and minimal palettes, another for MSG editing, etc. Fullscreen view support is now available. You can configure via preference settings whether palettes and toolbars and the cursor are displayed or not when in full screen view. This makes it easy to configure Studio Artist for video output in live performance situations where you don’t want the editing interface to be displayed in your performance video feed. This can also be set up for dual monitors so your main monitor (the performance video feed) goes into full screen display while your floating palettes on a second monitor (the control monitor) stay active. There is a new Favorites Preset Toolbar. This expands on the old preset favorites memories by providing an unlimited number of user defined preset favorites categories. Different preset types (like paint and image operation for example) can be combined together in a single favorites category, so you can organize all of the different operation mode presets you use for a certain kind of workflow in one category. You can access preset favorites in the main preset browser palette, but they can also be displayed in a compact favorites toolbar. The favorites toolbar lets you access custom preset categories with minimal impact on available screen real estate for drawing. Command keys can be used to switch between different favorites presets on the fly when working. An integrated help browser palette can be used to access html help pages while you work. Help pages can incorporate active command tags which allow you to execute Studio Artist functionality directly from a html help page. Active preset tags can be inserted in any html help page to load any preset by pressing the active link in the help page. You can use this feature to design custom help and documentation pages for your presets. For more information on working with the new workspace check out this tip. For more information on custom configuring the new workspace check out this tip. 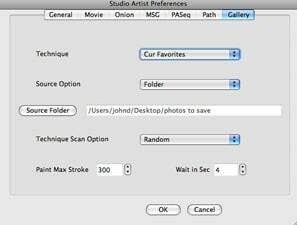 Studio Artist 4 is much more real time oriented than previous versions of Studio Artist. This means that you can interactively adjust editing parameters while automatic painting is taking place and observe the editing changes in real time as Studio Artist continues to paint. DualMode Paint is a new operation mode that allows for live interactive painting in conjunction with a second live image processing operation that runs in real time mingled with your live painting. Or you can use DualMode Paint as an automatic painting operation, again where live automatic painting is interspersed with live image processing. DualMode can be used to simulate things like painting on wet media. Or it can take you into limitless uncharted possibilities for live visual performance and abstract animation. Loop Action is a new way of using Studio Artist. When you run Loop Action the current preset is run repeatably in a continuous loop until you tell it to stop (by using the spacebar). Loop action allows you to use Studio Artist more like a live video synthesizer. If you switch to a different preset while running Loop Action, the new preset loads and the looping action switches to the new preset without stopping the live processing loop. This can be a different preset in the same operation mode (like 2 different paint presets), or a preset associated with a completely different operation mode (like a paint preset and an image operation preset). You can configure the source area so a loaded source movie frame advances for each cycle in the loop. Or you can configure live video so a new video frame capture takes place in the source area at the beginning of each cycle of the loop. Command keys can be used to switch between different favorites presets or PASeq action steps on the fly while loop action is running. New path start and time particle options allow for automatic painting to track the position of a Wacom pen floating in proximity above a drawing tablet, which allows for interactive control or modulation of dynamic automatic painting. For more information on live visual performance check out this tip. The paint synthesizer now provides support for anti-aliased vector drawing. Vector drawing can replace the traditional Studio Artist raster paint engine or can be used in conjunction with it in a single preset. For example, you could draw an anti-aliased vector region and then automatically sweep a raster water drip around the edge of the vector region in a single paint synthesizer preset that uses dual drawing. Be aware that some of the paint synthesizer controls that are associated with specific properties of raster paint will not be active when drawing with anti-aliased vectors. SVG vector output is now supported in addition to the old EPS vector output. There’s also a second vector print dialog that ties into the SVG generation process and allows for printing directly from generated vectors (the normal print dialog prints from the raster frame buffers) for high res vector printing. The SVG print dialog can also be used to generate PDF files directly from the SVG vector generation process. One nice thing about the SVG vector format is that it supports vector transparency. The Vectorizer has numerous additional new and expanded features, including a new anti-aliased vector render option. For more information on vector drawing checkout this tip. For more information on SVG output check out this tip. The Image Operations effects have been greatly expanded. There are a number of new Image Operations, and the old ones have many more additional and expanded features. The new Sketch Ip Ops are particularly exciting and provide for a wide range of different automatic pencil or ink sketch effects. There is a new Temporal Image Operations mode. Temporal Image Operations are image processing effects that take time and multiple frames into account. These allow you do some some interested new kinds of video processing effects. You can also use them to create static images from a video sequence that encapsulate the motion in the video sequence into a single image. Or you can use them to generate panorama images from video pans. There are over 100 new MSG processors included in version 4, which means the range of different effects you can create using MSG is even bigger than before. The paint synthesizer now also includes a MSG Source Brush option. The compositing and mix options previously available in image operations have been included for other operation modes like MSG, Warp, and the Vectorizer. This greatly expands the range of effects you can create in these extended operation modes, and allows for creating effects in a single layer that would have required multiple layers previously. For more information on the new Sketch Ip Ops check out this tip. The paint synthesizer is more powerful than ever. There are now over 460 editable parameters in the paint synthesizer. Many of the old parameters also have additional new options available for them. The new Live Extension path shape feature allows for some amazing new dynamic interactive paint effects. As you draw a paint path the old areas of the path are still live drawing and can drop under the influence of gravity or be whipped around like a springy chain. The path start regionization features have been greatly expanded. Much of the old MSG Evolver Art Mapper functionality can now be implemented directly in the paint synthesizer. MSG Source Brush allows any MSG preset to be used as a live interactive source brush for dynamic interactive painting. MSG presets can also be used as path start or path shape generators, or as a dynamic MSG brush load option. The paint synthesizer now support anti-aliased vector drawing as discussed above. You can also create dual presets that incorporate vector and raster paint effects into a single paint synthesizer preset. Vector drawing can go directly into the raster frame buffer or be output as EPS, SVG, or PDF vector files. 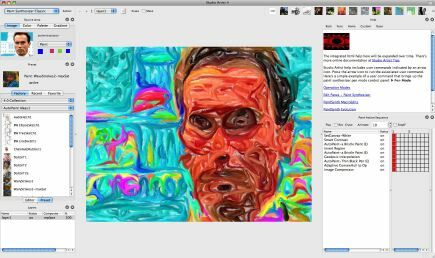 DualMode Paint operation mode allows a live image processing effect to be dynamically interleaved into interactive or automatic paint synthesizer drawing. PASeq Context action steps are a new feature for PASeq recording in 4.0. They provide an easy to use way to implement many of the old Studio Artist timeline animation functionality, including source and content keyframes, timeline warps, morphs, and spatially variant filtering. The functionality of the old Layer and PASeq timelines is now integrated into a single PASeq timeline, providing a simpler to understand interface. For more information on PASeq Contexts check out this tip. Gallery Show is a new feature that allows Studio Artist to run unattended endlessly riffing through different presets and source images to create an on-going artistic show. You could configure Gallery Show to create a real time painting frame or art process for display in an art gallery or used in a live visual performance. You can also use it to generate a stream of automatically generated random artistic images or presets you can cull through later for keepers. Gallery Show can work with random source images from a folder of images or can grab live video frame captures for each Gallery Show cycle. For more information on Gallery Show check out this tip. Parameter editing for the various operation modes now takes place in a standardized Editor palette (shown below). There are currently 2 different ways the parameter information in the Editor palette can be displayed, which you can change by changing the appropriate preference setting. We anticipate there will be more display options in the future. 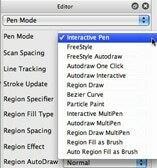 The old pen mode popup formerly at the top left of the canvas is now integrated into the appropriate op mode editors. 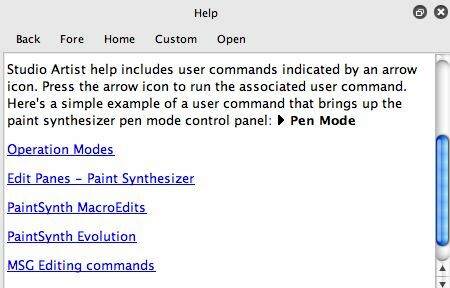 For the paint synthesizer, you would now adjust the pen mode in the pen mode control panel in the Editor (shown in the paint synthesizer editor screen snap below). The old background eraser controls formerly at the top right of the canvas are gone. You can access that functionality under the main canvas menu (default background), and cmnd b erases to the current default background, or by using the Erase button in the main toolbar. Preferences are now located in the StudioArtist menu where you would expect them in Mac OSX (as opposed to in the file menu like before). On Windows they are still located under the File menu. Studio Artist 4 has an integrated Help palette, which allows you to execute commands in Studio Artist by pressing the smart command links embedded in html help. Some things that were accessible via menu commands or buttons in previous versions are now accessed via help command links instead. For example, the Paint Synthesizer Macro Edits are available on a html help page in the Help palette as opposed to via menus like in previous versions. The old global evolution paint synthesizer control panel is also gone in v4, but that functionality can be accessed via the appropriate html pages in the Help palette. MSG Evolver 1.0 has not been ported in the Studio Artist 4.0 release. Much (but not all) of the old MSG Evolver functionality is now directly accessible in Studio Artist 4, via the Advanced MSG Editor palette and the Evolve Palette. You can run various MSG evolution commands via the appropriate help pages in the Help palette. The MSG live video processing functionality is now available in Studio Artist via Loop Action. The Art Mapper has not been ported at this time, however most of it’s functionality can be implemented using path start regionization in the paint synthesizer. The Evolver Tiling options are available via the new Tiling MSG processor. The Evolver timeline animation memories are not currently implemented, but you can keyframe MSG presets in the Studio Artist PASeq timeline to create keyframe animation. SuperSizer interpolation is now directly built into Studio Artist as opposed to being a separate menu command option. There’s a Default Interpolation option under the main Canvas menu (which includes SuperSizer as an option) that lets you choose an interpolator that is used for all Studio Artist resizing, including things like image operations that use the source as input for an effect or for setting the canvas to the source image. For more information on commonly asked getting started questions associated with the 3.5 to 4 transition check out this tip. Version 4.0 is a complete rewrite of the underlying code base for Studio Artist. While most of the features of version 3.5 are included or enhanced in version 4.0, there are a few things that did not make the initial 4.0 port. Either because we thought they were underused by the vast majority of users or were dropped from the initial 4.0 release so we could get a working program to users that addressed the majority of user’s needs. In 3.5 you can mix variable size layers within the overall canvas. While you can have layers in 4.0, they currently must all be the same size. Resizing or cropping currently resizes the entire layer stack (not just the current layer). The Timeline Animation operation mode is missing. Most of it’s existing functionality is available by using the new Context PASeq action steps. Bezier warp is not currently implemented. Bezier Collections are currently not implemented. The interactive region selection options have been streamlined. There used to be 2 timelines, layer and PASeq. This has been streamlined in 4.0 into 1 PASeq timeline. The old Layers timeline is now gone, leaving only a single PASeq timeline. You can use PASeq Bezier, Source, and Content Context steps to implement the old layer timeline functionality within the single PASeq timeline. Position contexts are not currently implemented since all layers in the layer stack are the same size in the initial 4.0 release. By using the new Context PASeq action steps you can duplicate most of the functionality of the old layer timeline within the PASeq timeline. A few of the old Interactive Adjust options are currently not implemented. The old canvas movie functionality is replaced with the new movie layer functionality. The old canvas movie lived on top of the existing layer stack. The old canvas movie has been replaced by movie layers. Movie layers allow multiple movie files to be associated with as many different layers desired. Some of the old canvas movie processing options are no longer available.